Finally, the united struggle of 33 lakhs Central Government Employees under the banner of National Joint Council of Action (NJCA) comprising Railways, Defence and Confederation has compelled the totally negative and unwilling NDA Government to negotiate with the staff side leaders. Hon’ble Prime Minister has intervened and directed three Cabinet Minsters viz. 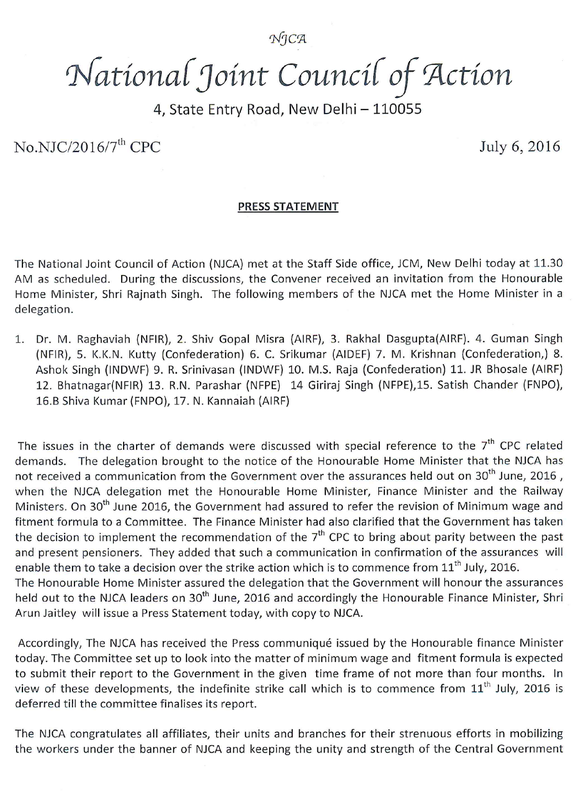 Home Minister Shri Rajnath Singh, Finance Minister Shri Arun Jaitly and Railway Minister Shri Suresh Prabhu to hold discussion with the NJCA Leaders on 30th June 2016. After discussing the demands raised in the Charter of demands, the Ministers assured that a high level committee will be constituted to consider the demands raised by NJCA especially the demand for improving the minimum wage and fitment formula. As no written communication or minutes regarding the assurances given by Group of Ministers is forthcoming, the NJCA met again on 6th July and decided to go ahead with the strike decision. 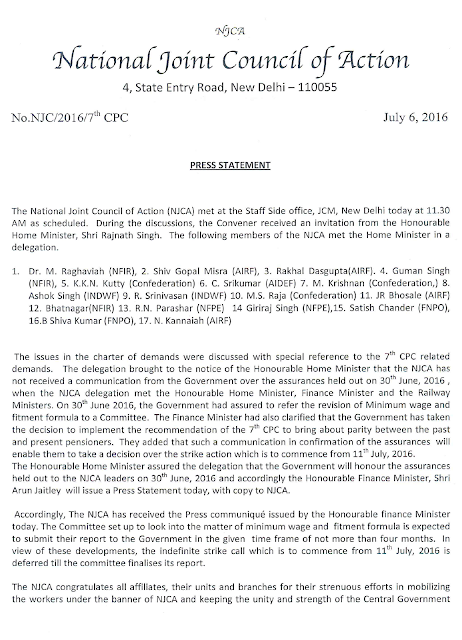 Again Home Minister Shri Rajnath Singh called the NJCA leaders for discussion on 6thJuly and reiterated the assurances already given on 30th June and stated that the Finance Minister will issue a press statement on 6th July itself confirming the assurances given by the Group of Ministers. It was further assured by the Minister that the proposed High level committee will submit its recommendations to Government within a time frame. 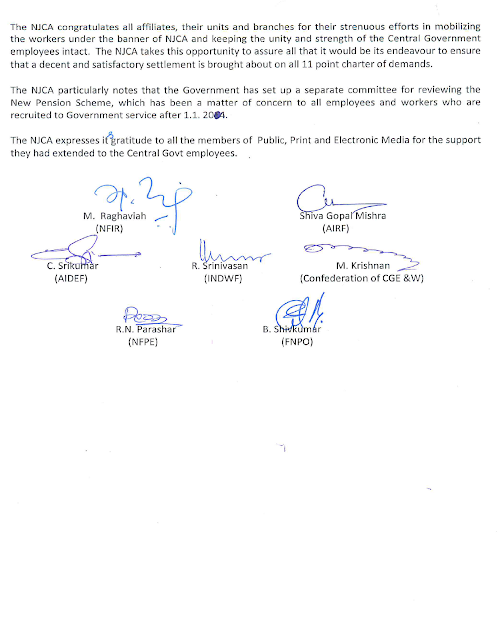 Accordingly, the Government issued the press statement and after detailed deliberations the NJCA unanimously decided to defer the indefinite strike till the committee finalizes its report. The press statement of the NJCA and the Government are attached.